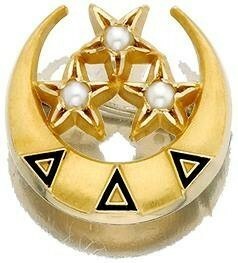 When the headquarters of Delta Delta Delta Fraternity (Tri Delta), the nonprofit sorority with chapters on 138 college campuses, found almost $400,000 in bejeweled gold membership pins missing and a sorority employee was arrested for the theft, weaknesses in the sorority’s hiring process and internal controls became apparent. The badges which were stolen were being stored at Executive Office following the deaths of the members which they had belonged to. This practice is in accordance with the Bylaws of Delta Delta Delta. Since the initial discovery, two years’ worth of badges that had been returned to Executive Office by women who either resigned from the Fraternity or whose membership was terminated have also been found to be missing, as well as badges for newly initiated members of as many as eight collegiate chapters. The arrest affidavit indicates that security video shows Seals and Stroface deactivating the Tri Delta offices’ security system after hours using Seals’ security system access code. When the pair leave sixteen minutes later, Stroface “appears to be concealing an unknown item(s) under his jacket.” The security system reflected a number of other instances when Seals’ access code was used during non-working hours to deactivate the alarm, according to the affidavit.Also according to the affidavit, Seals had previously “been counseled for bringing her husband to the business and being at the business after hours.”The affidavit says that Stroface’s fingerprints were found on the bottom of a drawer that had contained some of the stolen sorority badges. Seven theft by check convictions for amounts between $20 and $20,000, the most recent conviction date being in 2008. Two felony convictions for fraudulent possession of controlled substances, the most recent conviction date being in 2008. Two 1998 felony convictions for forgery of business checks. According to Tarrant County records, Seals received probation in six of these cases and in every case her probation was revoked due to new offenses or other misconduct. First and most obviously, their background screening process was nonexistent or might as well have been. Someone with Seal’s long term and continuing criminal history would be deemed unfit for any positions of trust by most employers. A good criminal background check would have given Delta Delta Delta the ability to make a well-informed hiring decision and likely prevented Seals’ employment. Although Delta Delta Delta management was aware that Seals brought her husband to the office after hours and had counseled her on at least one occasion about it, no steps were taken to limit her ability to deactivate the security system after hours. Many employers have workplace access policies that prohibit employees from entering the premises outside of scheduled work hours and repeated violations would lead to termination. Most modern security systems have the ability to notify management via email or text whenever the system is deactivated and by whom. If the Delta Delta Delta security system had such capability, one assumes that it was not activated. The keys to the storage area that contained the stolen pins were in a “key box” to which apparently all employees had access. In my webinars and presentations to SHRM chapters, I often warn employers that employment background checks, while important, only catch the low-hanging fruit – individuals who have already been identified by former employers or law enforcement as dishonest or unsafe. It is imperative that employers ensure that all of their other business controls are in place to ensure a safe and productive environment. Many employers aren’t willing to invest in quality criminal background investigations until after something has gone wrong. If you aren’t certain that your employment background screening process is fully protecting you, please call me (Mike Coffey) today at toll free 877-473-2287 to discuss how we might solve your problems.